Eating out is a treat – or is it? Research shows that women are happier & less stressed after eating at home. We’re also happier when we eat healthier meals. Surprised? I was – so I sat down and thought about it. Our homes are special places – places where we feel nurtured & cared for. These feelings support healthier food choices and these choices, in turn, help us feel even better. This home-centered cycle of healthy food & happiness provides a fantastic foundation for happier, healthier lives. Home Cooking East & West is here to help make cooking and eating at home easier, healthier and more enjoyable whether you cook for yourself or employ a domestic helper. My family decided to hire a helper back in 2015. At the time, my husband and I were working full-time outside our home and our son was a full-time student. To adopt a dog in Hong Kong, the dog rescue told us that someone had to be at home during the day. To make a long story short, I’m so glad we decided to hire a live-in helper and that this person was Elsa. Over time, Elsa learned what we needed from her and I learned the ins and outs of managing someone living in our home. 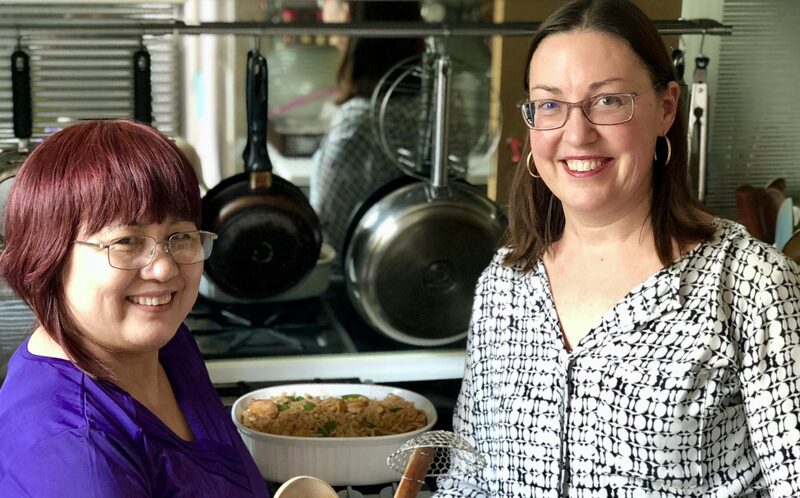 With my food and nutrition background, I was thrilled at Elsa’s willingness to teach me what went into the incredible Eastern meals she was preparing for us. At the same time, I taught her how to make our favourite Western foods. Because our experiences have been so positive, and since we’ve had so many kind reviews about our food, we decided that it would be fun to share them with others. Home Cooking East & West is the result. It’s a colourful cookbook with over 160 recipes from the East, the West and places in between. It also features a chapter on how to promote kitchen happiness with domestic helpers and another on healthy meal planning made simple. Elsa and I hope that you, your family and your helper, if you are an employer, enjoy it!